The Yale Peabody Museum of Natural History is based at Yale University in New Haven and is among the oldest, largest, and most renowned natural history museums in the world. Founded in 1866 by philanthropist George Peabody, the Museum is located at 170 Whitney Avenue in New Haven and has an array of permanent exhibits dedicated to the evolution of mammals and humans, wildlife, Egyptian artifacts and the Native Americans of Connecticut. The Yale Peabody Museum of Natural History has several world-important collections, including the Great Hall of Dinosaurs, which features a 100-foot long mural known as ‘The Age of Reptiles’ and a mounted juvenile Brontosaurus dinosaur. Collections at the Peabody include world-class vertebrate paleontology collections, including the most historically significant fossil groups in the United States, a collection of Incan artifacts from Machu Picchu, marine invertebrates, and one of the largest and most taxonomically comprehensive ornithology collections in the world. Visitors can enjoy a hands-on, interactive experience in the Discovery Room, where they can see and touch real natural history artifacts, and Scicorps – a science career orientation and readiness program for students is offered every weekend. The museum features a three-meter high, full-scale reproduction of a Torosaurus next to the entrance on Whitney Avenue, which is made from clay. Inside the Museum, permanent exhibits include the Great Hall of Dinosaurs, which features a full-scale skeleton of a Brontosaurus, an 110-foot long mural depicting dinosaurs in their natural habitats known as ‘The Age of Reptiles,’ and 11 dioramas on the plant and vertebrate ecology of Connecticut. The Museum’s permanent collection includes exhibits on anthropology, invertebrate and vertebrate paleontology, invertebrate and vertebrate zoology, botany, mineralogy and meteoritics, paleobotany, entomology, and historical, scientific instruments. Other displays include ‘The Riddle of Human Origins,’ a new exhibit showcasing human evolution with a variety of fossil fragments, ‘The Birds of Connecticut Hall,’ home to more than 700 specimens, representing more than 300 from the state of Connecticut alone, and ‘The Hall of Mammalian Evolution,’ which displays the ‘The Age of Mammals’ mural. The museum also features an extensive collection of minerals, primarily from Connecticut, an array of Native American artifacts from the Connecticut region, and a huge hall dedicated to the world of Ancient Egypt. The Discovery Room features an array of touchable specimens, live animals from around the world, including leaf-cutter ants from Trinidad and Tobago, giant hissing cockroaches from Madagascar, endangered dart frogs from South America, and a bearded dragon from Australia, and a range of hands-on activities for visitors to explore and enjoy. The Discovery Room reflects the Museum's collection of 12 million specimens and artifacts and offers a place for visitors to discover natural history through hands-on activities, interactive games, and touch-and-feel challenges. Exhilarating activities, challenges, and games include touching a 100-million-year-old fossil, finding all 16 of the Museum’s colorful live poison dart frogs hiding away in their rainforest habitat, learning to identify tree bark by touch, and collecting the bones of a rabbit. Visitors can also walk in the footsteps of dinosaurs and see live giant silk moths munching away. 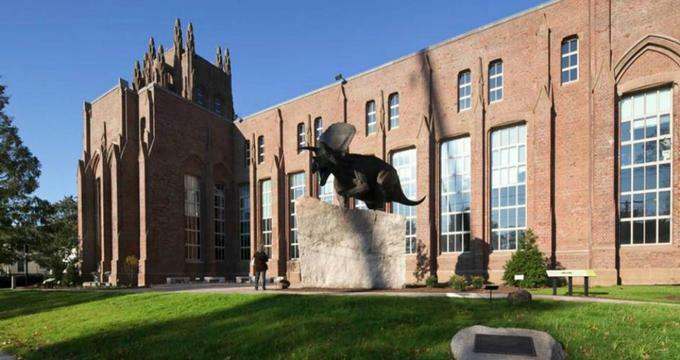 The Yale Peabody Museum of Natural History is located at 170 Whitney Avenue in New Haven, Connecticut and is open Tuesday through Saturday from 10:00 am to 5:00 pm and Sunday Noon to 5:00 pm. Forty-five minute Highlights Tours of the Museum are offered at no extra charge every weekend on Saturday and Sunday at 12:30 and 1:30 pm and are led by specially trained volunteer docents. The Yale Peabody Museum of Natural History offers a range of educational programs, classes, camps and lectures for both students and adults. Adult programs include talks and public presentations, natural science illustration programs, botanical programs and the O.C Marsh Fellows Program. Other educational programs and workshops include after-school programs, summer camps, school and group visits, community outreach programs and special celebrations.